This project initially began several months ago when Pennywise saw a tweet from Tom about wanting to retranslate this game. Ironically, Pennywise had had another translator look at the scripts for comparison purposes, but nothing ever came of it. 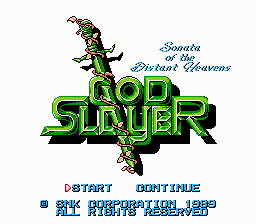 Fast forward and we now have a complete translation of the original Japanese God Slayer for everyone. While a solid translation for its time, Crystalis still suffered from the usual censorship and truncated script. This translation of God Slayer rectifies all that and gives interested players a chance to see what could have been. We also discovered the existence of text in the main script of the game devs congratulating you on beating the game. As of this time, we still don't know if it's used or not and preliminary checks have not yielded anything. Lastly, Tom and Pennywise have another project to announce. Discussed years back as a potential project, this translation has flown off the handles and is nearly done hacking-wise. The Nerdulus Constellation coming soon to a translation near you. I'm gonna have to check this bad boy out, thanks for the heads up on the release. NOICE! 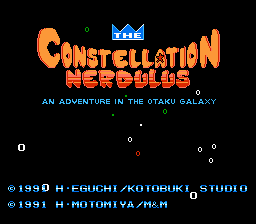 I played the gbcolor version of Crystalis years ago, but I always wonder how the original nes version would be. Good thing I didn't played it after the gbcolor version, because I'll be able to play as it was originally intended without all the filters and censorship of the official translation! You'll most likely enjoy the NES version a lot more. The Game Boy Color version was solid, but was a pretty bad port that tried to change too much. Is it possible to combine this patch with the main character sprite refresh? I tried both orders of the patches: bps first and ips second works, but results in the translated ROM with the original sprite. ips first gives a Japanese ROM with the new sprite, but the bps expectedly fails due to the check sums ... The fact that the Japanese ROM with the new sprite works fine, makes me think it might just work if there wasn't a check-sum check. As a fan of Crystalis I really appreciate your effort guys. Keep up the good work. Fascinating project. Worth it for the new title screen and original name alone. I was trying to find out online what else was different between the Japanese and US releases. I'm curious if there were graphical or mechanical changes more if they mostly had to do with the script. You could always try contacting the author of the edit to see if they can help you. I don't believe there's any differences aside from script. Hmm... Would you be willing to try and inject the translation into a ROM patched with the new sprite? Since, the Japanese ROM seems to work with the new sprite, I'd assume that your injection tools would simply continue to work. In that case, it should just work with your regular build process. I loved Crystalis growing up. I've been playing this translation and I'm loving it more than the US version. I'm nearing the end of the game and I have thoroughly enjoyed it. Thanks to all that have worked on this. I'm so happy to hear that, StratosVX! Played from beginning to end. Excellent translation (and very well written)! Even though i've played Crystalis multiple times its wonderful to finally see what i missed out on from the original. One minor quibble: Athene should be named Athena if her appearance in every SNK fighting game is anything to go by. I am glad that you enjoyed the new translation! Let me clarify the situation regarding Athene. The character's name in God Slayer is アシーネ (Japanese: Ashi-ne, with an e - Athene). The character you mentioned, the one she was clearly inspired by, is named アテナ (Japanese: Atena - Athena). Although Athene was most certainly inspired by Athena, she is not Athena. The two names are actually different. Hope that clarifies the situation for you! Overall nicely done I thought. Clear dialogue that left me satisfied and not confused. I'm going to play the official USA version before posting an on-site review. One thing I've wondered about: if TV overscan crops ~8px on both left and right side, did the devs care about the dialog box being chopped? Because full view shows lots more "glitches" that look like they were meant to be hidden. That's common for NES games. Mister Xiado ported Crystalis Computer Repair for Japan. It fixes the naming screen backdrop and adds a few touchups. Since it's submission got rejected, M.Xiado sent me above link. It's fully compatible with translation also. Thanks for reviewing the translation patch, emerilfryer!